Though it can’t think – much less think twice -- about anything, the laboratory worm underwent a surprising mutation that made it prioritize the survival of adults over creating abundant offspring. Researchers noticed the sweeping change in behavior, and the mutation, after LSJ2 had faced hardship for 50 years. The mutation in the LSJ2 strain amounted to a small deletion in its DNA. As a result, a large protein changed by a meager 10 of its roughly 3,000 amino acids. “It’s a diet of watery soy extract with some beef liver extract,” said Wen Xu, a graduate student who researches with McGrath. Sounds yucky enough to humans, but to the roundworm, it's worse. It equates to a regimen of bread and water. “What you usually find is mutations that play narrow, very specific roles,” McGrath said. “They only affect egg laying, or they only affect life span, or they only affect dauer formation." Edward E. Large, Yuehui Zhao and Lijiang Long from Georgia Tech; Shannon Brady and Erik Andersen from Northwestern University, and Rebecca Butcher from the University of Florida coauthored the paper. Research was sponsored by grants from the National Institutes of Health (numbers R21AG050304 and R01GM114170) and by an Ellison Medical Foundation New Scholar in Aging grant. 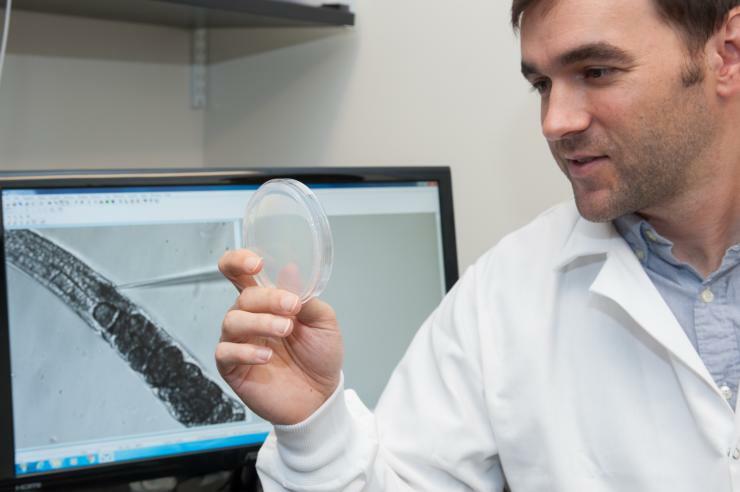 Patrick McGrath holds up dishes with two lab strains of the C. elegans roundworm. 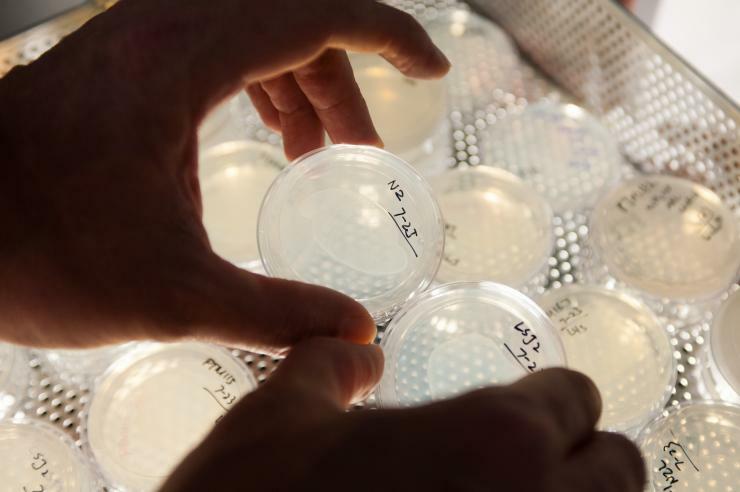 Strain LSJ2 (dish on right) dramatically changed its survival strategy to live longer and have fewer offspring due to a tiny mutation on its NURF-1 gene. Researchers at Georgia Tech confirmed the effects of the mutation by duplicating it in lab strain N2 (dish on left) via an injection with CRISPR Cas9. CRISPR Cas9 DNA is injected into a lab strain of C. elegans roundworm to confirm the sweeping effects on survival strategy from a tiny mutation. 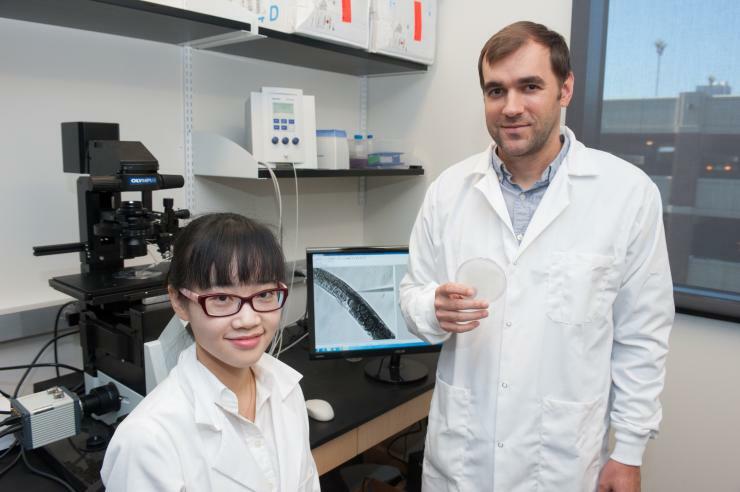 Researchers Patrick McGrath and Wen Xu at a station used to inject a C. elegans lab strain with CRISPR Cas9 DNA to confirm the effects of a tiny mutation that triggered an overhaul of survival behaviors. Georgia Tech researcher Patrick McGrath holds up a dish containing microscopic C. elegans roundworms. In a novel discovery, McGrath linked vast life history trade-offs to a single, tiny mutation. 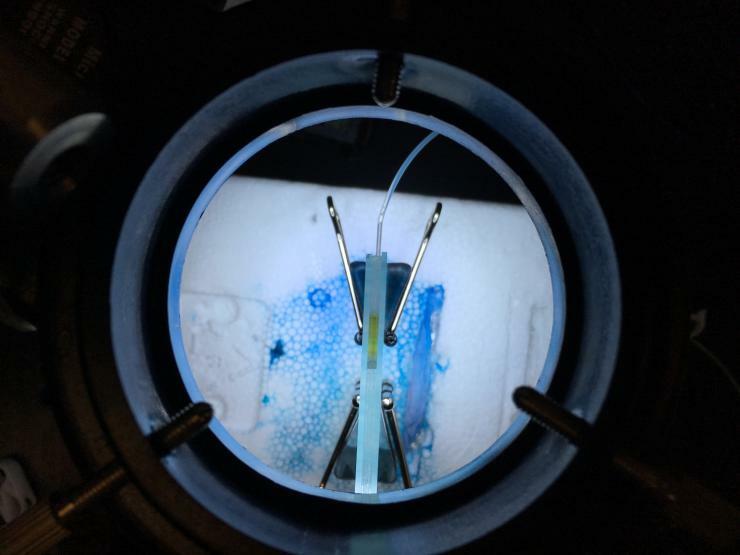 On the screen, the magnification of a C. elegans being injected with CRISPR Cas9 to confirm the mutation's effects. 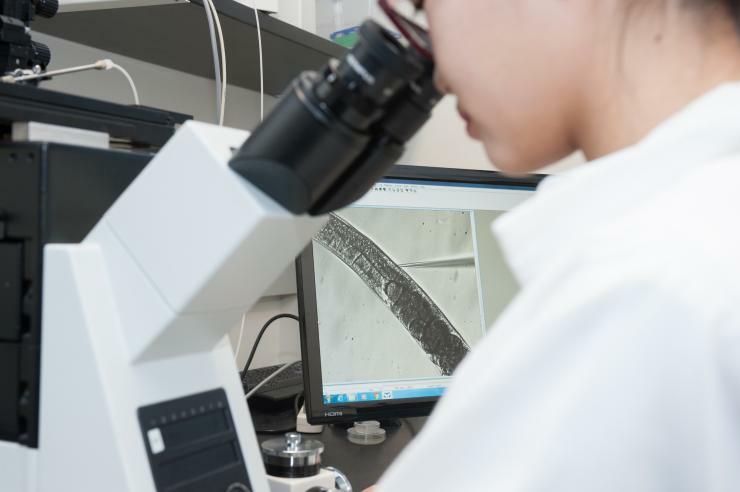 Researcher Wen Xu uses a needle with a microscopic point to inject a C. elegans roundworm with CRISPR DNA. The gene editor helped confirm the sweeping effects of a tiny mutation Georgia Tech scientists have discovered. 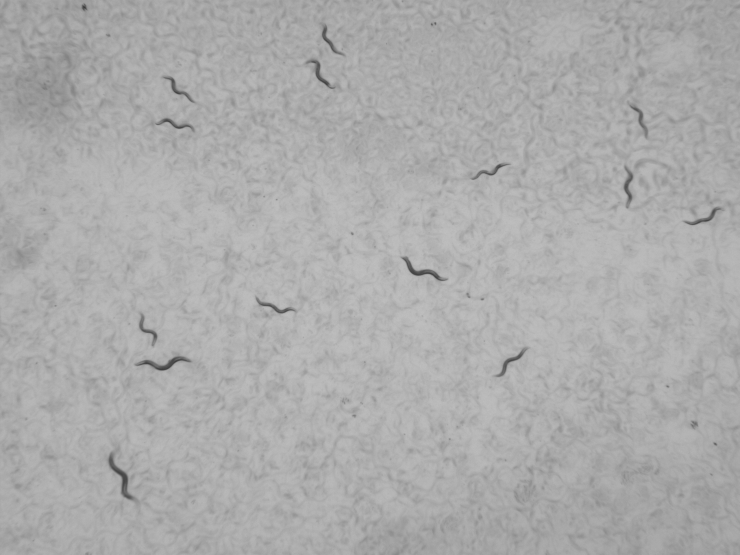 C. elegans lab strains N2 and NURF-1 mutants under the microscope. 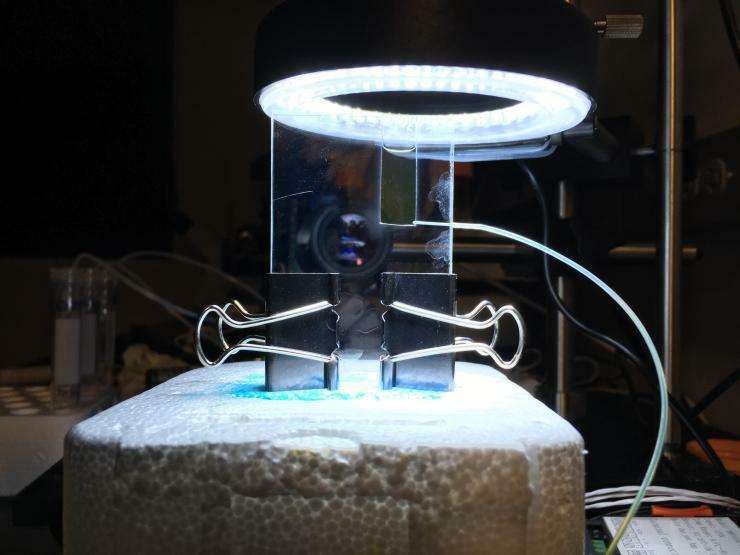 In a separate experiment, Patrick McGrath's team at Georgia Tech is testing to see if C. elegans roundworms will mutate into the ability to swim by letting them live in a verticle slide filled with fluid. The worms would have to adapt to swimming to be able to move around the slide.